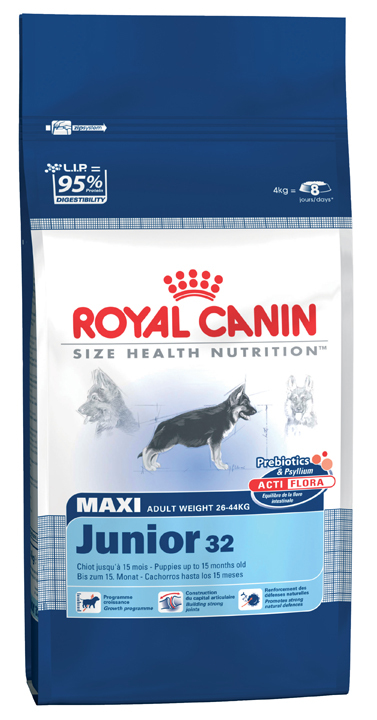 Royal Canin Maxi Junior dog food is suitable for large breed puppies aged between 2 months - 15 months old. Large breed puppies are pups who will weigh over 26kg when they are adults. - "Acti Digest" formula: For optimal digestive safety. fructo-oligo-saccharides, DL-methionine, egg powder, casein, vitamins. Typical Analysis: Protein 36.0 %, Fat 14.0 %, Ash 6.5 %, Fibre 2.5 %, Moisture 9.0 %, Calcium 1.1 %, Phosphorus 0.9 %, Sodium 0.35 %, Magnesium 0.1 % .